Our cats love to watch the birds. The more activities we can create for birds outside our windows, the more entertained our cats are for those long lazy days of spring and summer. The birds have plenty of water and it's all fun to watch. If you already have a drip irrigation system, this little project will add a nice look and great functionality to your yard or garden. The materials for one of these spout poles was less than $20. I made two of these spout poles in a few hours. If you don't have a drip-irrigation system, you will need a drip-irrigation timer to fit an outdoor faucet or "hose bibb", some 1/4" drip-irrigation hose, a drip irrigation "emitter" or "bubbler" and a few fittings to put it all together. Emitters are available in several flow rates. I used a 1/2 gallon per hour emitter. Make sure you follow the manufacturers directions for assembling and using the drip irrigation components and be aware of any local ordinances regarding drip irrigation systems and back-flow safety requirements. 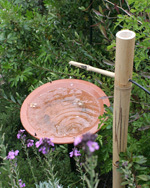 The body of the spout pole in my case is a 2"diameter bamboo "lodge-pole." Any size will do as long as the hollow inside at the top of your spout is at least 1-1/4" across. Another smaller length of bamboo - about 1/2" - will serve as the spout itself. The smaller piece should not have any cracks. Cut your bamboo lodge pole to length. You will probably want to bury it at least 9" in the ground, perhaps more for added stability. Make sure you leave at least 2" of open hollow above the top joint, and make sure your pole is tall enough - once buried in the ground - for the output end of the spout to clear the top of your birdbath. 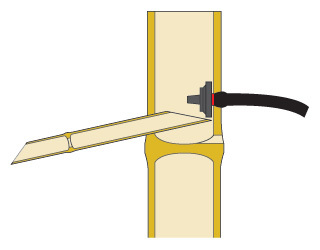 Cut your spout as long as you want, but make sure you will be able to reach all the joints with a drill bit so you can drill out the joints to allow the water to flow through. Cut one end of the spout at a fairly steep angle to form an oval-shaped "catch basin" to catch the water from the drip-irrigation emitter. The "output" end of the spout can be any shape you like. Drill a hole at a slight downward angle just above the top joint. Make sure you drill a hole that is no larger than the "input" end of your spout. You may need to sand or file the hole a bit larger to get your spout to fit snugly. Drill a 1/4" hole in the pole on the opposite side of the spout high enough so the emitter will be positioned above the catch basin end of the spout. Drill another 1/4" hole directly below the first hole, just above the joint. This will be the drain hole. You don't want your pole to fill with water in the rain! Thread one end of 1/4" drip-irrigation hose into the top 1/4" hole. Push it in and work it towards the top of the pole. Pull enough through so you can attach the emitter. Attach the emitter, and pull the hose back down into the pole till the emitter snaps tight against the back of the hollow. Work the spout into the body of the pole. The "catch basin" you created by cutting the input end of the spout at a steep angle should fit nicely below the output end of the emitter. Make sure the spout is snug. Install your pole, and attach the drip-irrigation lines. Turn on the water and enjoy!